The change process will need to be driven through leadership across our health and social care system. norm during the second half of the 20th Century, to a system which is much more responsive to supporting people with long-term conditions live independently in the community. In order to make the transition to the new model of care, the Scottish Government has provided partnerships with additional funding over a number of years. We used the Older Peoples Change Fund to support a range of new projects, some of which delivered a lasting impact and hence have been continued with mainstream NHS/Comhairle funding. The Scottish Government has given each partnership access to an Integrated Care Fund. Our share of that pot locally is £640,000 per annum. The first year of that resource has already been committed to expanding the number of long-term care beds we have on the islands in order to reduce the number of older people living in hospital. So we will see the expansion of the Bethesda care home so that we can provide nine respite beds, which will allow the other care homes to dedicate their capacity to long-term care.The Scottish Government has also identified a delayed discharge fund, which is designed to support system change to reduce the number of people waiting in hospital (£200k per annum locally). 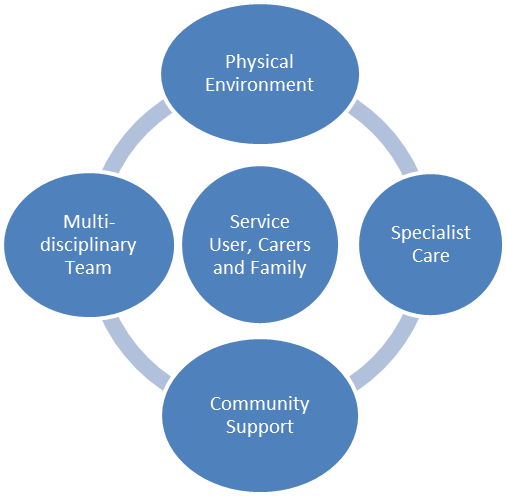 While we will mainstream the Integrated Care Fund resource by 2018/19 to support the cost of additional community care beds, during 2016/17 and 17/18, the resource will be used to support initial double running costs associated with the reform of mental health services and the implementation of intensive reablement and intermediate care. The delayed discharge fund will be used to support the ongoing costs of a highly responsive community equipment store, which is a pre-requisite of an effective reablement service. In addition, we will develop clear links to our Area Clinical Forum; Managed Clinical Networks; Adult and Child Protection Committees and other appropriate professional groups. Our success will also be dependent on creating the conditions for professionals to use their experience and judgement to maximum effect in improving outcomes for service users. This will be focused on improving the coordination of care across different professional roles; the effectiveness of communication within and across disciplines; and the empowerment of professionals to make effective evidence-based decisions. The reforms which we are proposing are intended to move us towards that operational environment, where multi-disciplinary teams are the norm and where interventions are built around the needs of the individual. One of the major innovations of the health and social care integration agenda is to put a renewed focus on the importance of community leadership and community development. This is about more than just the empowerment of Locality Planning Groups, important as that may be: it is also about building on community assets and infrastructure to ensure that local people are able to live purposeful lives. This will mean that people are socially connected, to friends and family; are able to pursue the every-day activities that support people’s interests and ambitions. This is often provided by community initiatives which are supported by multiple funding partners and it is important that we continue to support community ventures even when resources are tight. There is emerging evidence of the value of a ‘place-based system of care’, which involves organisations collaborating to improve health and care services for a geographically-defined population, managing the common resources available to them. This is often based on strong community engagement relationships, which drives the reform process within localities. This is a model that we would like to explore in the Western Isles. The consequence of this shift will not just be our budgetary provision changing over time but also how we deploy our staff – our most valuable asset. We will work with our staff teams to support the transition towards community based care, including consideration of any training and support arrangements that have to be put in place. In order to deliver against this wider objective, we will also take forward key workforce policies designed to attract, retain and support people to deliver high quality health and social care.